Candy B of FBC Clinton, LA delivered a healthy 6+ lb. 19+” baby boy, Timothy yesterday morning. Pastor Steve Graham arrived home safely from Russia on Saturday. The Men’s Summit held here in Lakeshore MS the last weekend in Oct was a great success. Many new friends were made. For all the victims of Sandy, the folks down here in the Mississippi gulf coast understand your losses and their thoughts and prayers are with all those affected by the devastation. Reading about the shortages and delays we pray that patience and kindness will prevail not tempers and hostility. Pray for tomorrow’s election. We understand the sovereign grace of God will triumph, pray believers will do their duty and vote. For all the prayer requests spoken and unspoken from First Baptist Church Clinton, LA yesterday. Please continue to pray for Mike and Naida as they strive to do God’s will concerning their moving to Lakeshore, MS.
For Rebuilding Lakeshore ministry and Lakeshore Baptist Church. There are many needs, including a new large mower; money to wire the donated house, that the church build plans would get approved and completed quickly. Employment for; Robert O., Iva F., Marie F., Jessica R., Mike T. and Tom D. seeking fulltime work. New England Prison Ministries, Inc.
Over 65,000 men and women are incarcerated in New England jails and prisons. They are lost, lonely, harassed and helpless. They are desperate for a way to change their lives. Thousands will be released to our communities this year. We expect that somehow they will find jobs, raise families and become productive citizens. The sad fact is most of them will be back in jail within a year or two. The mission of New England Prison Ministries is to rescue these lost sheep- to help released prisoners stay out of jail. for more churches to come forward to sponsor the unassigned Angel Tree children. for Prison Fellowship president Garland Hunt as he speaks to pastors in Michigan. May God provide new relationships and vision for future ministry opportunities. for the six Operation Starting Line events that will take place November 6-8 in Florida. for the leaders of the women’s ministry at Calvary Chapelin Kendall, Florida, who are in the process of forming a partnership withPrison Fellowship to do reentry and in-prison ministry. for fruitful conference calls with our collaborating mentoring organizations. The Bible warns us, “Do not merely listen to the word, and so deceive yourselves. Do what it says” (James 1:22). Recently I made a new friend in Hawaii who has taken that message to heart. Roy Yamamoto was a career criminal in Hawaii. When he decided to follow Jesus, he was illiterate. Wanting to grow in his knowledge and trust of the Lord, Roy asked God to teach him to read. Roy picked up the Bible and was able to slowly begin to read and understand. The more he read the Bible, the better he did. As his mind expanded, his heart changed, too. Roy became a pastor at a local church and focused on ministry to inmates and their families. He established Camp Agape, a camp that serves Angel Tree children in Hawaii and has extended to the mainland. God is growing Roy’s ministry, and he is being used to reach into every prison in Hawaii. He is also serving the 1,700 Hawaiian inmates that are being held in a rented prison in Arizona. Roy has even been able to arrange for family members of inmates in Arizona to visit with the dads and sons who are incarcerated thousands of miles from home. Even when there’s not an ocean between them, prisoners are often separated from their families by shame, grief, and the sometimes-insurmountable expense of personal visits. Through Prison Fellowship’s Angel Tree program, you, like my friend Roy, can help connect inmates and their loved ones through the delivery of a Christmas gift and the Gospel. Local churches are urgently needed in critical areas. Go to http://www.angeltree.org today to give or register your church. P.S. To learn more about Angel Tree, and to find out how you or your church can get involved please visit the Angel Tree website, or call 1-800-55-ANGEL. 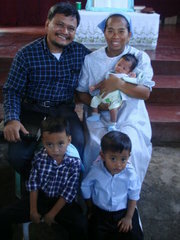 Please continue to pray for their financial needs. We need to continually unite in Prayer, remembering that our Lord promised He would take heed. Prayer for the Men & Women, around the country, who take the Gospel into the prisons. TO GOD BE THE GLORY!!!!!!! How are you today? Praying for you all there…. Missed you all… How’s your mission there? Praying you are all well 3John2. Please pray with us… on November 19, 20, 21, 22, 23, is our travel to inter island preaching the gospel… we will be preaching while traveling from island to island from Bacolod City Bredco Port to Dumangas Port Iloilo… then Iloilo City to Passi city to Capiz and Aklan…. we will be traveling by sea from Caticlan Port to Roxas Port and traveling in Occidental Mindoro…. then going to Calapan port Oriental Mindoro to Batangas Port to Batangas area. Our purpose is not only for drop by preaching’s and soul winning but also to get the 50 boxes of gospel tracts there in Batangas… We will be going home and traveling port to port again. Please pray with us… we need around $400.00 traveling expenses. We are praying for the provision of this urgent need…. Thank you very much and God bless you and your family and ministry!!!!!!! I have had one inquiry regarding our ARBCA churches on the East Coast and know that many of you will be interested. I have attempted to contact all on or near the Coast but at this point have only been able to speak to four pastors and heard indirectly from another through one of the children. Marc Grimaldi, pastor of Grace RBC in Merrick, Long Island, reports that they have lost power but do have water. There is no damage to the building. Some of the church families that live near the water probably have damage to their homes. Ed Baci, pastor of First Church of Hixville, North Dartmouth, MA reports that they do have power. There is minor shingle damage to the church and the weather vein blew off and landed in the street. For them the storm was not as severe as predicted. Matt Foreman, pastor of Faith RBC, Media, PA reports that they do have power and were spared the worst. Some families have lost power. Jim Dundas, pastor of Grace Fellowship Church, Lincoln, DE reports that they lost power for only 45 minutes but it came back on. The church building did take in some water in the 10 inches of rain but that is minor. He reports that they feel they were miraculously protected. Sam Owen is pastor of Grace RBC, East Haven, CT. A daughter attending a college reports that her parents are without power but there has been no flooding yet. A week from today we leave for Argentina & Chile. Pastor Jerry Slate from Georgia will join Nancy & me in Dallas to make the 9½-hr. flight to Santiago, then over the Andes to Córdoba, Argentina. Please pray for the work and our safety. As many of you know, Christ Reformation Church here in Tillamook underwent a real trial a few years ago when a serious case of child abuse occurred. But out of that trial, as He always seems to do, the Lord has brought much good. I preached a 21 part sermon series on domestic abuse in the church and we put that series on Sermon Audio (sermonaudio.com/crc). We began to receive thankful comments from victims of abuse who had found the series and were profusely thankful for it. Over time, the Lord has brought other things about as a result. We now have a blog at cryingoutforjustice.wordpress.com where we minister to victims of abuse (mostly Christians) from all around the world. We write articles to educate the evangelical church about the mentality and tactics of abuse and we interact with victims as they tell their stories. We believe that many of these cases are nothing less than the world’s hatred for Christ and His people, playing itself out in homes where one spouse is a Christian and the abuser is not. Needless to say, we continue to be educated by interacting with these people. Last year, I was contacted by Calvary Press, through their discovery of the sermon series, and it was suggested to me that I write a book about how domestic abuse hides within our churches, unseen. I have never written a book before and the task seemed daunting, but I continued my reading and research and, to shorten the story, this last week our book went on sale. It is entitled A Cry for Justice: How the Evil of Domestic Abuse Hides in Your Church. It is available at the Calvary Press website (http://www.calvarypress.com/products/a-cry-for-justice) or for pre-order at Amazon.com (just search under Jeff Crippen). This, then, has been a very surprising field of ministry that the Lord has brought to us. We would never have dreamed that we would be serving Him in this area, but here we are. I highly encourage every pastor, every elder, and every member of every one of our ARBCA churches to read and become educated on this subject. You will learn, as we did, that over and over again, well-meaning pastors and Christians are being duped by abusers and won as their ally in the oppression of victims who so often suffer in silence. When Scripture tells us that the enemy is quite able to appear as an angel of light, it means just that. We have learned more about the psychology and tactics of sin from studying in this field of domestic and sexual abuse than we ever learned before.